The tower of Pisa (or Leaning Tower), situated in Piazza dei Miracoli together with the Duomo, the Baptistery and the Camposanto, is the symbol of the city besides being one of the most famous monuments in the world. There is a controversy about the name of the original architect of the tower, but we know excactly that it dates back 1173. For many years, untill the recent excavations, the design was attributed by Vasari to Bonanno Pisano, but probably the tower was constructed by Gherardo di Gherardo. During the Middle Ages, people belonging to the aristocratic class visited and climbed the Tower. For this reason, the building material of the stairs was marble instead of wood. When the third ring was constructed, the building started leaning, because the structure weigh on the foundations. This was the principal reason why the construction was interrupted and continued only in 1275. Another cause of the proclivity is of course the condition of the ground under the bell tower. In the past the area was a reclaim land and nowadays one part of the construction leans in a swamp, while the other in a more sandy ground. The other three floors were built with an opposite inclination in order to balance the equilibrium of the tower. During the centuries, architects tried to straighten it, but in vain. Although in 1944 a terrible bombing threatened the stability of the tower, fortunately it resisted untill today. Finally from 2001 the tower has been opened again to the public and it is possibile to visit it ( after a period of 11 years in which architects have been retrieved half a degree of inclination from 5,5 to 5). On the balcony there are 7 bells. Here, Galileo Galilei performed the experiments for study the equations for a falling body. Today the tower is controlled through extremely modern technology. WOULD YOU LIKE TO VISIT THE LEANING TOWER OF PISA? Once in Pisa or in Tuscany, you can't miss the occasion to visit the most famous tower in the world! With this tour you will enter the Leaning Tower of Pisa and have a 30-minutes tour where you will step all the 294 stairs... and pay attention to the slope! The highest point of the leaning tower is 186 feet tall, 3 feet lower (183 feet from the ground) to the side of the roof leaning towards the ground. It weighs 16 thousand tons. approximately, with 294 stairs in the south facing staircase and 296 stairs in the north facing staircase, its walls 13 1/2 feet thick at the bottom and about 8 feet thick at the top. 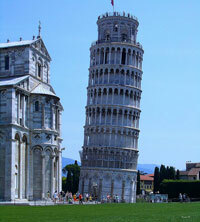 Would you like to see the Leaning Tower from Florence? You can visit Pisa and the Leaning Tower with a half day tour that will drive you from Florence to Piazza dei Miracoli with a guided visit of Leaning Tower of Pisa (exterior visit), Baptistery (exterior visit) and Cathedral (visit inside). You will then have free time to explore Pisa on your own. Guided visit of Piazza dei Miracoli: Leaning Tower of Pisa (exterior), Baptistery (exterior visit) and other important monuments and venture into the historic Cathedral. Then the tour continue with a walk to Piazza dei Cavalieri, in search of Scuola Normale. The tour can be prepared on your special interests in art, archicture, history or culture.